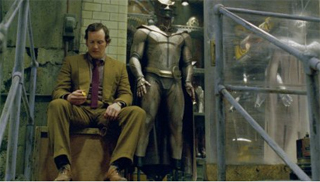 The times, they are a-changin’, and so must elements of Watchmen when bringing it to film. Fundamentally and occasionally slavishly, Director Zack Snyder leaves the skeleton of the classic graphic novel alone, but also fleshes it out with modern movie language, for better and for worse. Does this make Snyder the “visionary” ads tout him as? Perhaps not, but he has delivered a film worth thinking about, as much for his own touches as for the weight of the source material. Let’s get the most controversial change out of the way. Yes, Snyder and screenwriters David Hayter and Alex Tse alter the villain’s master plan from the original, which upon reflection makes that character a lot more overtly villainous. However, it also makes a little more sense, bringing another character to a more logical (and heroic) conclusion. 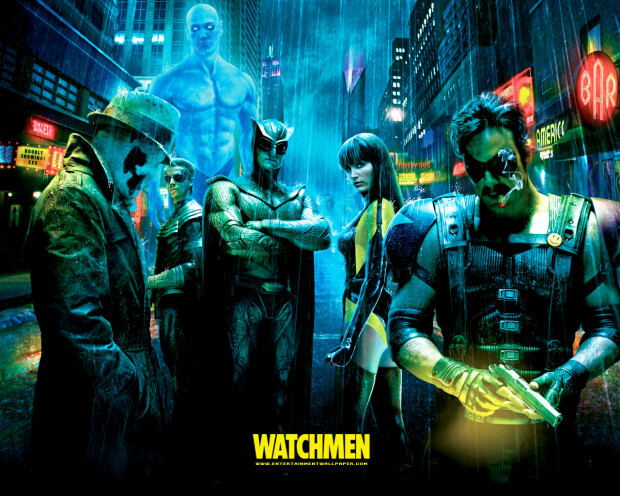 Of course, Watchmen is more about ripping apart those heroic tropes, and Snyder’s film has no qualms about upping the ante there. Where Dave Gibbons’ original art gave us hints of violence frozen in a panel, Snyder offers sickening bone-crunching, spatters of blood all over the place. Speeding up, slowing down, sometimes holding, the action becomes completely up to date, even though the film remains set in an alternate 1985. It would be nice to think that, too, is intended as commentary on audience expectations, but it’s more likely the ultra-violence is just meant as a sop to those who require such things from an R rated movie. And that’s where things break down a bit – the nagging feeling that every now and then, Snyder can’t help but aim for the cheap seats. He makes a few ridiculously obvious music choices and has a tendency to throw in real world pop culture references. That sits at odds with the care he’s taken to make even Richard Nixon look like a Dave Gibbons caricature, and not the real man. Snyder keeps accidentally taking us out of the world he’s building by reminding us of our own – when one of the points of the story is that for reasons unknown, the presence of actual masked adventurers has utterly changed the culture. Yet I admit, and it maddens me, that some people may very well need those anchors. As it is, Snyder has to remind us of a time gone crazy. For a lot of target moviegoers, that’s a hazy era at best, yet absolutely the right choice for the story. The script adds a few direct scenes with Nixon that might not have been out of place in Dr. Strangelove; if everybody’s crazy with fear or bravado, putting on latex – spandex just has no place – isn’t really much more an insane decision. Unless you’re going out and beating up criminals, perhaps. There the heart of the graphic novel remains beating strongly. Laurie Jupiter (Malin Akerman) and Dan Drieberg (a perfectly cast Patrick Wilson) might joke about the masochistic criminal Captain Chaos, but they are no less screwed up when it takes getting back into costume to cure impotence. 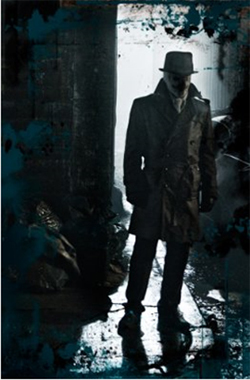 Of course, they are relatively normal when compared to Rorschach (Jackie Earle Haley) and Dr. Manhattan (Billy Crudup), two heroes who have become their identities so completely that the world may hang in the balance. Because Snyder went for mostly talented actors, he earns a pass on the more jarring spins he has put on things. Haley’s performance, though obviously closely modeled on the work of Alan Moore, still manages to add a little ambivalence to scenes, as well as sympathy. It’s an acting job that makes us wonder if we quite caught – or flat out understood – everything about it. In a much calmer way, Crudup allows us to understand the complexity of Dr. Manhattan’s detachment from humanity. Aided by CG work that occasionally makes it seem like a universe is alive inside him, Crudup delineates a believable arc for a man on his way to deity. The more grounded characters are mostly on target as well. Matthew Goode’s Adrian Veidt seems too slight to be the ultimate specimen of humanity, and he wears his outrageous ego like a mask in and of itself. There’s just something slightly Eurodisco about him that feels out of place, and that’s not just because of his obvious weakness for hanging out at Studio 54 or his incredibly bad blond wig. The weakest link may be Akerman, though in the book Laurie has the hard edge and misplaced anger that the actress imbues her with. We just don’t get a chance to see any other side, and that may be as much a problem with the massive scope of the story leaving things out. One subplot involving the first Nite-Owl (Stephen McHattie) starts and never comes back around to fruition, though it must surely be in the massive already promised Director’s Cut. Those are things that only fans of the graphic novel would know anyway. What stands on screen works, though occasionally the pacing has fits and starts due to the moments where the film pays too much attention to its source. Action stops dead for a rumination on Dr. Manhattan’s origins, which worked for me, but might not for other audiences. Of course, that’s just the way the book worked. So it’s a little bit simplified. What remains still has a lot of scope, and should provoke a lot of discussion. In truth, like with The Dark Knight, it feels really good to walk out of a so-called superhero movie and be arguing about ideas sparked by the film, not just whether or not certain moments were cool or stupid. 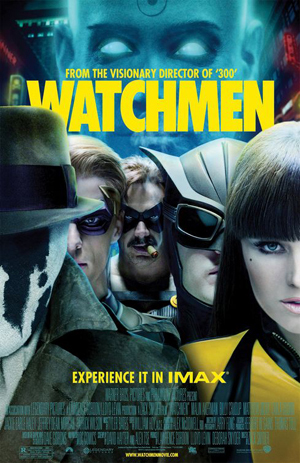 Like its source, Watchmen has us wondering, and is worth revisiting. And if you don’t buy that, thenthe graphic novelremains unchanged, and you should read that again, too.